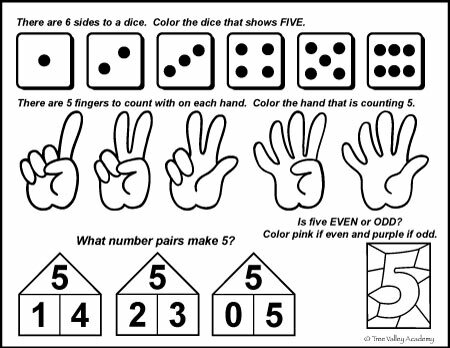 Today we’re learning Kindergarten or Grade 1 math skills that revolve around the number five. 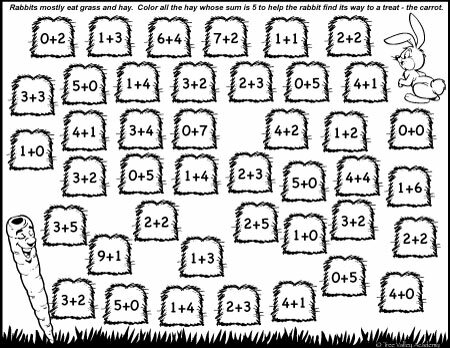 I made these number bonds worksheets for my daughter and now I’m sharing them with you. If you need to reprint the letter tiles for your child to be able to glue the letters that spell FIVE on the first page, you can download them again here. 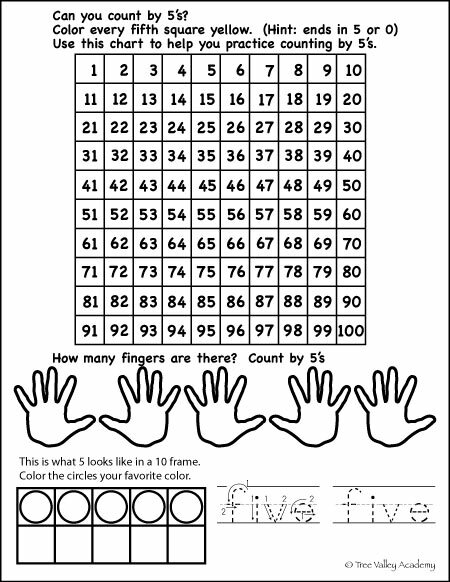 For the mental math option, make sure your child knows what “5” looks like on the abacus. One way you can show them is on the free app “Talking Abacus”. You might have already downloaded it from our previous lessons. If not, you can download it here for an iPad, or here for an iPhone. The bead above the middle beam is worth 5. Remember, we learned that a bead only gets counted when it’s touching the middle beam. So to count 5, simply bring the bead above the middle beam down so it’s touching the middle beam. Cards: All the Aces, 2’s, 3’s, 4’s, 5’s and Jokers of one card deck. We need 4 wild cards, so grab 2 jokers from another deck or use the 2 extra junk cards that usually come with many card decks. A total of 24 cards. Card Value’s: A is 1, wild cards are zero, and 2, 3, 4 and 5 will be their own value. Suits are not important in this game. 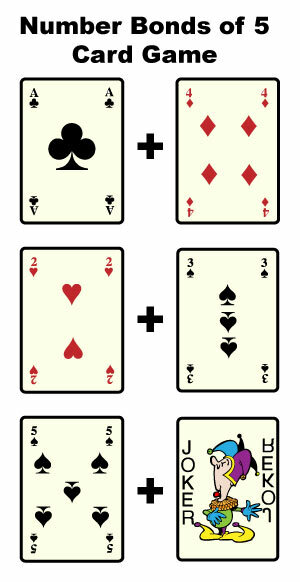 Deal: For a 2 person game, deal each person 6 cards. The remaining 12 cards can be split so each person has another pile of 6 cards, face down. How To Play: Play the same way you would GO FISH. It’s a great way to practice the number bonds to 5. You need to make pairs whose sum is equal to 5. So for example, if your child has a 4, but no Ace, they should ask “Do you have an Ace?” If you do, you give it to them, if not say GO FISH and your child will need to pick a card from their pile of 6. Whether or not, the card requested was received, before ending their turn, they have one chance to put down one pair of cards that equals to 5. To put a pair of cards down, one must say the math equation they are putting down, for example: “I am putting down a 4 and an Ace, because 4 plus 1 equals 5.” If either of us runs out of cards in our hand, we then pick up the remaining cards in our own pick up pile. Once one of us has finished all our cards (in hand & our pick up pile), the game ends. Winner is: The person with the most pairs wins. If there’s a tie, the person who ran out of cards first wins. I hope your children are enjoying math. If you have any comments or suggestions for these worksheets, feel free to let me know. 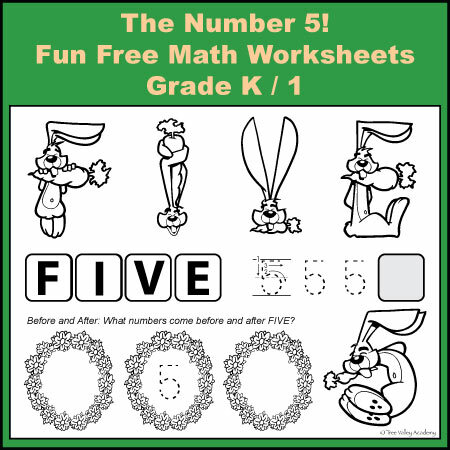 That’s it for this week, come back next Monday for all new fun math printables for the number six. Thanks for sharing at Totally Terrific Tuesday! Be sure to stop by again this week to link up your latest projects. The party starts tonight at 10pm Eastern time. We hope to see you there!